My usual go-to holiday cookie is the Chocolate Crinkle. In fact, I've made these every year since I was in my teens. This year will be no exception, but I found myself trolling the cookie recipes when an Exchange at work was announced. Or if I'm being honest, not when it was announced, but when I had four hours left in my Sunday and the exchange was taking place on Monday at 9am. I knew I was going to make a batch of crinkles later that week for our family Christmas - we're celebrating this weekend due to crazy family travel schedules - so I wanted to find something a bit different for work. After reviewing America's Test Kitchen Family Cookbook, I landed on Molasses Spice. 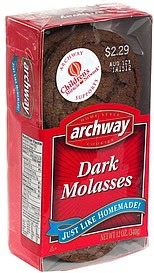 I've always loved Molasses cookies - did you guys have Archway cookies at your grocery store? I grew up grabbing these off of the store shelves, but have never made them myself. I ran to the store for allspice and molasses - and hey, while we're at it, more butter, eggs, flour and sugar. 'Tis the baking season, after all. Pre-heat oven to 375. Set aside 1/2 cup of sugar for rolling the cookies. Whisk dry ingredients (flour through salt) together. In the mixer bowl, beat butter brown sugar and remaining 1/3 cup sugar. Beat in egg yolk and vanilla. Then mix in molasses. Add flour mixture and keep on low speed until combined. With wet hands, roll dough into balls and then roll into the sugar. Lay on parchment paper-lined cookie sheets. Or, if you are like me and don't have parchment paper on hand, use greased tin foil, just to ensure no sticking! Bake for 10-12 minutes, one sheet at a time, taking them out when there are cracks along the top but seem underdone on the inside. The KitchenAid mixer made things go pretty quickly and soon enough I was rolling the dough in a shallow dish of sugar and popping them in the oven. Our oven likes to overcook things, so I was keeping a close eye on the cookies. The first batch looked pretty perfect on top, but were slightly overdone on the bottoms. I realized I had to go even further against instincts and take them out when they barely looked baked at all. 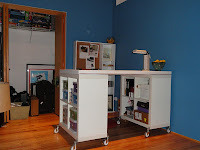 The second batch was perfect - they hardened on the wire rack quickly and stayed softer and chewier longer. I packed them in a tin and brought them in for the exchange. I like to dump my cookies on a display plate and then use my same tin to collect all of the others. That night I came home with gingerbread, cut outs, chocolate peppermint and more. Even a few Oreos from a non-baker who means well. And, of course, extra Molasses Cookies for home!